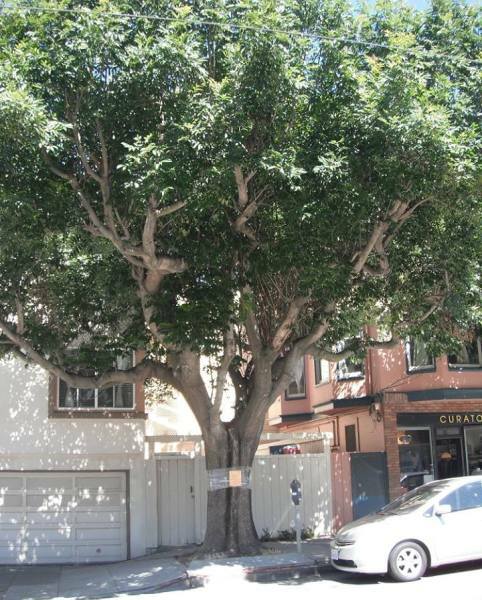 Can We Save These San Francisco Trees? There are plans under way to cut down hundreds of street trees along some of San Francisco’s main thoroughfares. Generally, these plans get little publicity until the trees are posted with 30-day notices (these are the notices that inform neighbors that the trees are to be cut down). Neighbors are often shocked and dismayed at these plans. Though the notices usually provide a contact to protest the removal of the trees, by that point it’s an uphill battle to save the trees. It can be done: Consider the saved trees at Fisherman’s Wharf, and next time you visit there, consider how bare the road and brick walls would be without the trees! But it takes mobilization, determination, speaking up, persistence and luck. Removing mature trees and planting saplings instead doesn’t provide the same benefits. It takes decades for the replacements to grow to the same maturity – and meanwhile, all the benefits to environment, health, and habitat are accordingly reduced. We would also point out that urban trees (or any trees) are seldom perfect. They grow in challenging conditions. Often, the justification for removing trees is that they are not in “good” shape. We would point out that unless a tree is actually hazardous, the standard should not be perfection, but that it is “good enough” to survive in the location to which it has adapted. We don’t have any details yet, but the Treasure Island Development Agency is planning to cut down trees as part of its development plans. We would note that this is one location where Monarch butterflies overwinter in some years. We believe even more tree removals are planned, for instance along Geary. The San Francisco Forest Alliance will try to keep track of these projects and post what information we can about the proposals. San Francisco can do better than this. If all our public agencies realized the true benefits and value of mature trees, they would seek to preserve them rather than cutting them down and replacing them with saplings. Or nothing at all. We all recognize that trees sometimes need to be cut down to allow for roadwork or construction. But we do think that preserving trees needs a much higher priority than it currently gets, and the public needs better (and earlier) information than it currently gets. 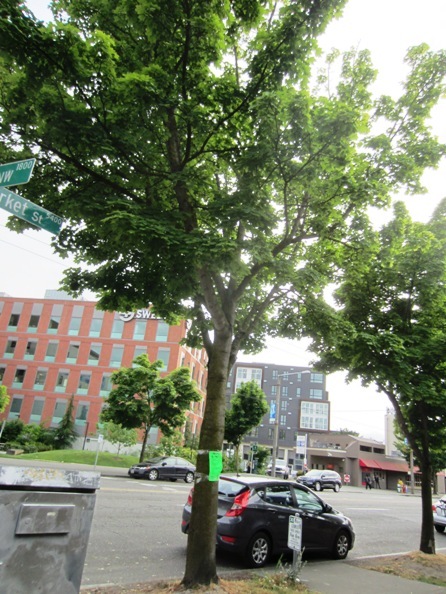 We wrote about Seattle, where road-work was accompanied by notice to save trees, not remove them. Here’s another. It’s a tree not even as pretty or mature as the San Francisco victim at the top of the page, but it’s been saved. Trees are cut down for all kinds of reasons in San Francisco. Poorly designed projects are a major factor. So is poor maintenance. We support Supervisor Scott Wiener’s effort to fund tree maintenance by city experts rather than leaving street trees to home owners who may not have the expertise or resources to care for it and instead destroy it. 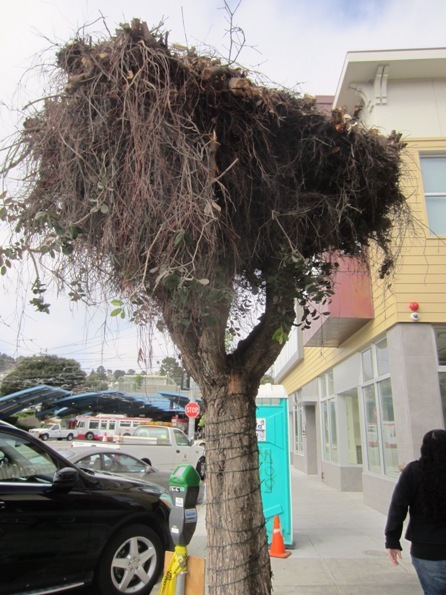 4 Responses to Can We Save These San Francisco Trees? Wow, this is sad! As a Tree Pruning Service, we are now facing losing our beloved trees to the drought and it saddens me. I saw the notices on the large mature trees that add so much to Van Ness. Is there any organized effort to push the city to select a better alternative that protects these protected trees? Will Van Ness now become like Market St. or Embarcadero? Is that what we want? Thanks, I’ll attend the hearings and tell my neighbors. I remember when Gavin Newsom had targeted goals for planting trees in all city neighborhoods. Hey Ed, step up! 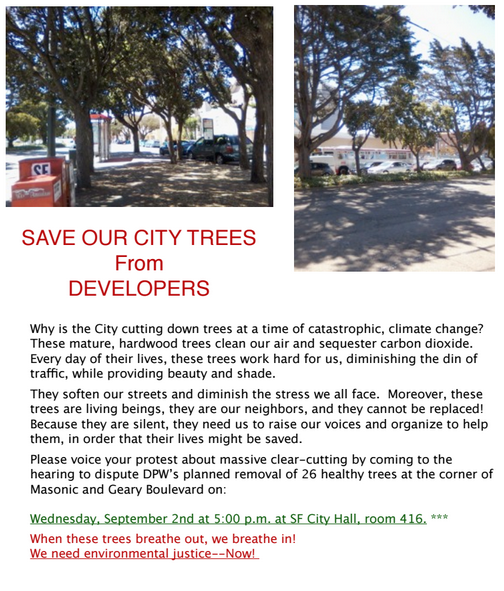 The trees which are giving many benefits to the environment and are very ancient and mature should not be removed as it will affect the climate of San Fransisco. We also being a tree care service serving the sonoma county area are not happy with this news.